Diabetes discussion forum for all. Supported by Diabetes UK, but run and managed by an independent team of volunteers with diabetes. A well moderated forum, with no adverts and sensible advice in the main. There are lots of different threads, which may feel a bit overwhelming as quite a few are not T1 specific, but some helpful tips and friendly chat. 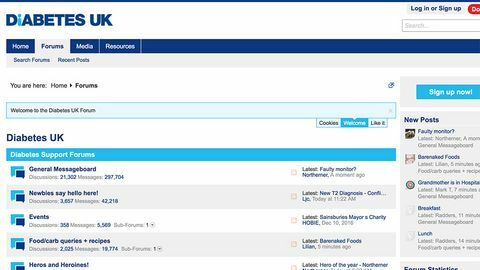 I think this forum is superb, Diabetes UK set it up a number of years ago but they do not run it. If you are not a Facebook or Twitter user or other anything else like that then this forum could be for you. You will find people with all types of diabetes including carers and parents and they all communicate and support each other. The forum is moderated by some really sensible and knowledgeable people who have type 1. They are not medical professionals but keep a close eye on information and online behaviour. I wouldn't hesitate to recommend this forum to parents of children with diabetes or adults with diabetes themselves as another way to communicate with others in the same position as they are.